Udupi, Feb 23, 2016: Vishwesha Tirtha Swami of Paryaya Pejawar Mutt on Feb 22, Monday stated that despite the Adani Foundation having donated Rs. 50 lakh to his mutt for the construction of a community hall, he was opposed to the expansion of the coal-based thermal power plant of Udupi Power Corporation Ltd. (UPCL), based at Yellur in Udupi district. The UPCL, a unit of Adani Group, received the go-ahead from the government recently to expand its capacity from 1,200 MW to 2,800 MW. Addressing presspersons here, the Pejawar seer said that he had told the chairman of the Adani Group, Gautam Adani, during his recent meeting with him, that the power project should not be expanded until all the environmental concerns of people in the surrounding villages were addressed. The seer said that the UPCL should solve the issues of discharge of flyash and the contamination of wells in the villages surrounding the power project. He had also told Prime Minister Narendra Modi, when he had last met him, that industrialisation should not be taken up at the cost of fertile agriculture land. The same applied to UPCL as well. He recalled that he had taken up fast for a day in protest against the problems caused by pollution of the thermal power project at Nandikur in Udupi district on January 9, 2012. “I will definitely back any struggle by the people against the thermal power project,” he said. However, the seer said that he saw no duplicity in accepting donation from the Adani Foundation and opposing the thermal power project belonging to it. He had made his opposition to the pollution problem clear while accepting the cheque from the foundation recently. “If Gandhiji could accept money from industrialists such as Ghanshyam Das Birla, there is nothing wrong in me doing so. I am not bigger than Gandhiji. Most of the educational institutions accept grants from governments that face charges of corruption. Does that make them corrupt? If people stop taking donations and grants, how can institutions be run?” he asked. “I will accept donations and grants. But I will remain steadfast in upholding my principles. 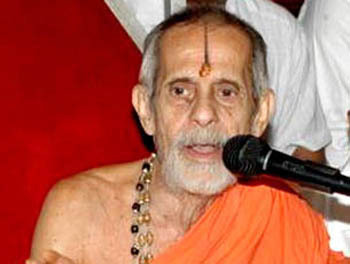 In this case, I am opposed to pollution and expansion of UPCL,” the Pejawar seer said.